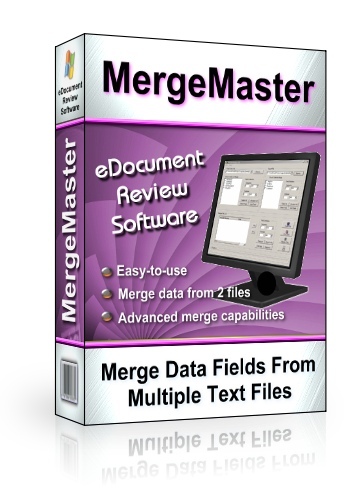 MergeMaster is a revolutionary program created specifically to merge data found in plain text files. Created based on years of experience working with plain text files. A user-friendly interface with "point and click" functionality enables even the least technical user to become a professional at merging files. It meets the unique needs of Document Management and review in Litigation Support Services as well as any other field of work. MergeMaster is a program which merges data found in plain text files. ...... e. columns and the delimiters used. Merges files regardless of what the field delimiters or text qualifiers are, Gives you the ability to rearrange the order of the fields in the resulting ASCII text file, Edit the names of the fields for the new file, Choose which fields you want to appear in the resulting file, Choose the delimiters you want in the resulting file, You can change the multi-entry delimiters found within the fields of the new file, An advanced merge allows the population of data fields in a text file with information from a fielded text file based on their corresponding Bates numbers. The perfect solution for Document Management. Get the ability to do what litigation support companies do with just a few clicks of a button and cut costs. Business Card Designer Pro designs your stunning business cards easily. Qweas is providing links to MergeMaster 1.4 as a courtesy, and makes no representations regarding MergeMaster or any other applications or any information related thereto. Any questions, complaints or claims regarding this application MergeMaster 1.4 must be directed to the appropriate software vendor. You may click the publisher link of MergeMaster on the top of this page to get more details about the vendor.